Showers Archives • Curran Home Co.
We stock showers, shower doors and trays to suit all spaces and styles. 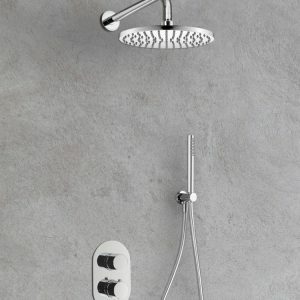 From drench showers to dual flow showerheads, our collection of shower mixers is a modern blend of design, quality and style. All shapes and sizes of shower door are available from square to offset quadrant. Wet rooms can be catered for with our range of modern screens. Brands available include Meryln and Ionic.